Voting and sound systems within the Dáil chamber have to be upgraded. THE RECALL OF the Dáil on Wednesday means that some Oireachtas staff will have to work through the weekend. Works to upgrade much of Leinster House have been carrying on all summer and, while a recall was always planned for, Wednesday’s special sitting will mean work continuing all weekend. 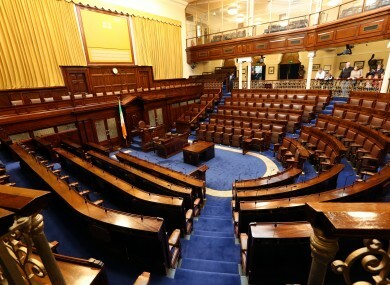 In July, when the Dáil rose for the summer, an Oireachtas spokesperson said that “the wear and tear on the fabric of the House has become evident”. Added to that, voting and sound systems within the Dáil chamber have to be upgraded. A statement from the Oireachtas says that the sitting to discuss the Apple tax ruling will work around the work that has been completed. “Our contingency plan for a recall during the work on the installation of new technology in the chamber will be initiated. The work on the new systems will be suspended until this sitting is complete. “While this suspension will allow the sitting to happen, a major body of work still remains to be completed on the new systems before Tuesday, 27 September when the Dáil reconvenes. “This remaining work includes further installation works and extensive testing of the new system, configuration of the electronic voting system and the full integration of all of the new systems. There is to be refurbishment of the existing historic windows, window shutters and other internal joinery items, as well as stone repairs both internally and externally. The Office of Public Works says it wants to reinstate the original entrance door to Leinster Lawn (including demolition of the existing portico) and carry out work on the plaster ceilings. Email “The Apple ruling has ruined some weekend plans for some Oireachtas workers”. Feedback on “The Apple ruling has ruined some weekend plans for some Oireachtas workers”.